I have never been an aficionado of the old west. While I’ve enjoyed my share of spaghetti westerns, I’ve never seriously studied the history and lore. The HBO series Deadwood did spark my interest a bit since it takes pains to try and incorporate historical details into the series wherever possible. Plenty of liberties were taken but it was one of the few westerns that got me googling the names and places from the show. While I hadn’t considered looking for it in our travels, it turned out Deadwood was pretty central to our exploration of the black hills. Since we had to drive through it many times in our journeys, we decided to stop, look around, and enjoy what the town had to offer. Deadwood viewed from the boot hill graveyard. It’s actually a bit smaller than in its historic photos. Our first stop was the main commercial drag in deadwood. According to the many interpretive signs, much of it had been preserved from the turn of the century. A lot of what you’d have seen from the frontier days was burned down and long gone but many of its early stone buildings are still standing and in use. Unfortunately for us, most of them are in use as small Bar/Casinos or tourist shops filled with cheap T-shirts or plastic trinkets. The restaurants were either all fast food or crammed with slot machines. The best I can say for it is there were many Pokestops along the avenue so we got in some good Pokemon Go time. It always saddens me in these kinds of strips that cheap and gaudy places crowd out any kind of genuine restaurants and stores that have local crafts. It always seems like if there is gambling at the heart of an attraction in a small town everything gets turned into a bland, cheap cookie cutter business with no heart or soul. I don’t really understand why that is but it seems consistent in our travels. 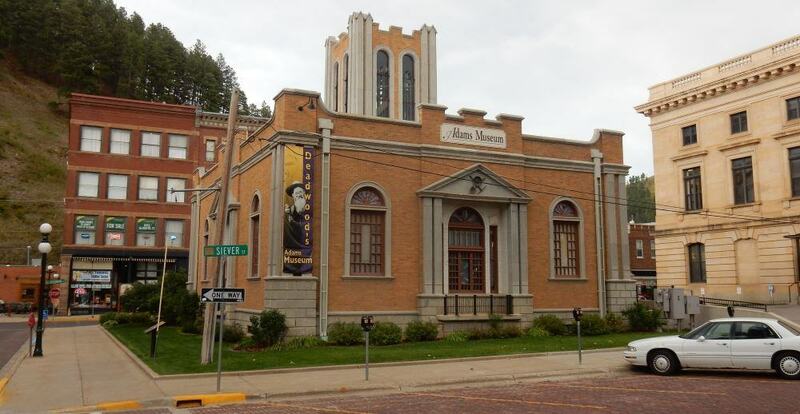 This museum was closed when we visited the town but it looked nice from the outside. Desperate for some decent food, we left the historic strip and headed over to where the government buildings were. More cheap Casinos greeted us but we did eventually find an old Gas Station turned bistro that turned out to have excellent sandwiches and zero slot machines. It was nice to find something that felt authentic and heartfelt in this town. With our batteries charged (both figuratively and literally as there was a cell charger built into the bar), we decided to pay the Deadwood boot hill graveyard a visit. The graveyard is up on a hill overlooking the town of Deadwood and is a stark contrast in character from the tourist trap below. If you come during normal hours there is a small $2 charge to enter which goes towards maintaining the grounds. You get a great map of the site including all the most famous graves as well as a history of the graveyard and the people of the town. It was clear right away that the money is put to good use in keeping the graveyard in good order. Even on a gloomy clouded day, the graveyard has a very pleasant atmosphere. The terrain is hilly so you are in for a bit of a hike wandering amongst the graves. I was expecting old tombstones and a relatively simple graveyard but over they years it has been lovingly kept and even upgraded. Nearly every grave includes a well cared for marble headstone. While they are not original headstones, they are all done in styles evocative of the period. The variety is impressive and the overall feel of the place has an enchanting quality to it. It is the picture perfect graveyard. One part of the site offers a fantastic view of the town and features photographs of how this view looked at different times in the town’s history. It was great to look down and note the similarities and differences comparing the photos to the town before you. 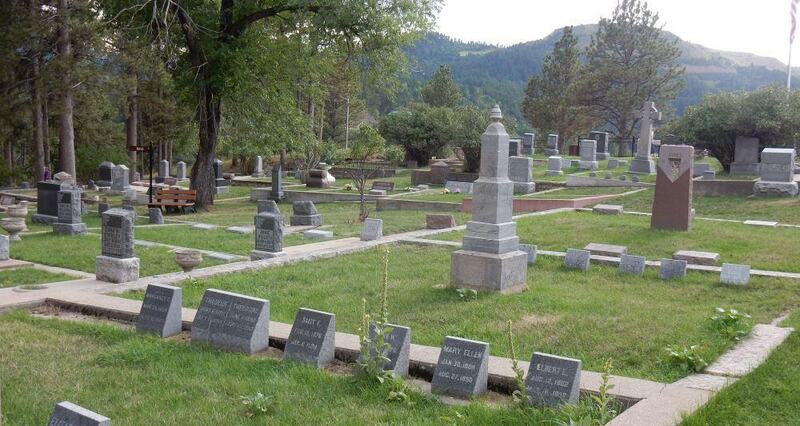 We visited the graves of a number of deadwood characters. Wild Bill Hickock being the most famous followed by Calamity Jane who was moved nearby in more modern times. It really felt like this was where the history of the town was remembered and loved. Wild Bill Hickock’s grave and shrine. 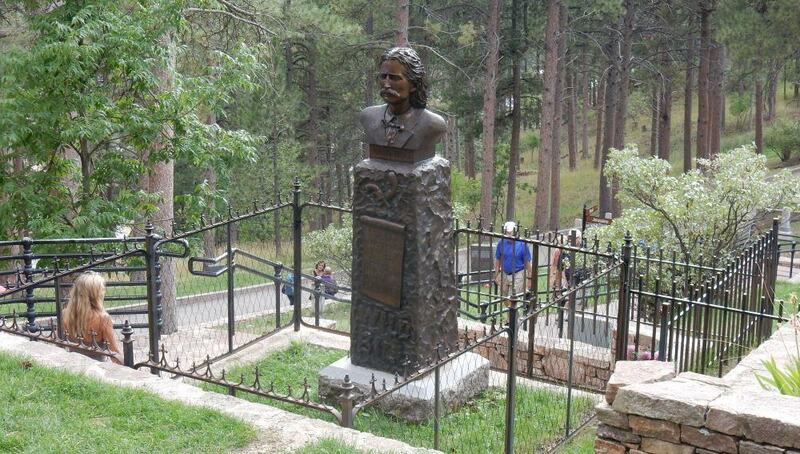 While not from Deadwood originally, he was murdered there in 1876 and figures prominently in local legend.